Another Klitschko family member made the social scene this week in New York - Nadia Klitschko (photo center), mother of the famous Ukrainian boxing siblings, Vitali and Wladimir. Youthful-looking enough to be a sibling herself, Mrs. Klitschko has a very busy life in Bonn in her role as the wife of a diplomat. During a tour of Ukrainian institutions in the City on March 8, Mrs. Klitschko was accompanied by Iryna Kurowyckyj (photo right), President of the Ukrainian National Women's League of America. The two dropped in for a preview of the new facility housing The Ukrainian Museum which will open its doors to the general public on April 4. 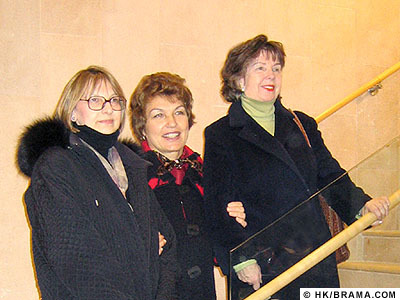 Joining Nadia Klitschko and Iryna Kurowyckyj in the photo (left) is Daria Bajko, Administrative Director of The Ukrainian Museum. NOTE: Mrs. Klitschko was in New York City to attend the Persons of the Year award which was given to her two sons by the Ukrainian Institute of America last Tuesday (ARTICLE - SLIDESHOW).